Set your calendars, people. 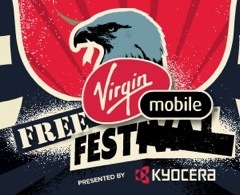 July 24th, 10am, tickets become available for this year’s Virgin Mobile Free Fest on September 25th at Merriweather Post Pavilion. The very impressive bill, which you will be able to see for a grand total of $0, is Jimmy Eat World (whose new album is dropping around then), The Temper Trap, DC-based Electronic act Thievery Corporation, rapper Ludacris, indie darlings Pavement, Yeasayer, LCD Soundsystem and Matt & Kim, plus Edward Sharpe & the Magnetic Zeros, Joan Jett, and T.I. These tickets always sell out. Be ready to exercise your clicking finger early on Saturday morning to get these tickets. Who wants to grow mustaches and go see Yeasayer and Pavement with me!? how is it that Thievery Corporation music is electro? way off base there – lounge, downtempo, world fusion, etc – but electro? not even close!! When what a band plays in their live shows is decks and a synthesizer, and when their own website describes them as a “production duo,” it’s fair to call their act “electronic.” Which is where it is widely categorized. What seems unreasonable is dismissing an entire group of music writers based on one writer’s one genre classification with which you happen to disagree. Electro does not equal electronic. electro is a genre of music. electronic is a method of producing metro. thievery corporation does not make electro music. while their music is produced electronically, the full band performs it live, it is not an electronic or pre-recorded performance. your article needs to be corrected. your article called them Electro. its really funny that a website/blog called “WE LOVE DC” knows nothing about Thievery Corporation and had to go to their website for information. epic fail. go back to the burbs. I don’t find it at all shameful to acknowledge the use of indisputable, verifiable sources to confirm facts. i see you corrected your post. i feel vindicated. You’re welcome to your opinion, Mr. Cerutti, but you should keep the insults to a minimum. Please read our commenting policy.